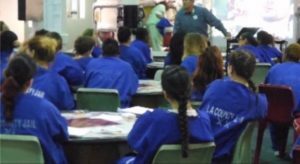 LOS ANGELES – The Los Angeles County Board of Supervisors voted Tuesday to settle a federal class-action lawsuit brought by women subjected to unconstitutional strip searches at Century Regional Detention Center in Lynwood. Terms of the settlement were not disclosed. The board voted 3-0 to approve the settlement, with Supervisors Janice Hahn and Mark Ridley-Thomas absent due to illness. Supervisor Sheila Kuehl briefly mentioned the allegations in the case before the board went behind closed doors to discuss the settlement. “When we read the description of it, we were horrified,” Kuehl said of the strip searches that occurred between March 2008 and January 2015. The plaintiffs alleged that strip and body-cavity searches were conducted in groups of up to 60 women crowded together in an outdoor bus bay with a roll-up door open to the jail’s reception area where male employees work. They accused deputies of using obscenities and abusive and demeaning language during the group search. Some alleged that deputies required inmates to insert their fingers into their mouths after touching other body cavities. In 2017, a federal judge ruled that the women’s Fourth Amendment rights had been violated and the parties began mediation. The sheriff’s department installed body scanners at the downtown Inmate Reception Center in 2014, following recommendations by the Citizens’ Commission on Jail Violence aimed at reducing strip searches at all county jails. After consultation with outside correctional experts, 18 more scanners, including two at CRDF, were installed by last May. A December report to the board by Sheriff Alex Villanueva said that 8,124 scans had been conducted at CRDF in the first nine months of 2018 and not one inmate refused the scanner in favor of a physical search. However, the “department routinely conducts strip searches of inmate housing locations and inmate personal property during day-to-day operations within all custody facilities to maintain safe jail facilities for inmates and staff, while also removing potentially dangerous contraband” and data on those day-to-day searches is not tracked, according to the report. As a matter of policy, the county does not publicly disclose the details of legal settlements until all parties formally agree to the terms. 1 comment for "L.A. County Board votes to settle strip search class-action suit"
Does anyone know the Law firm handling this case?